When businesses offer a competitive benefits package, they attract top talent, offer current employees a better quality of life, and develop mutually beneficial relationships with workers. We offer four recommendations on how businesses of any size can put together a benefits package that suits diverse employee needs. Employers, especially small businesses, often find it difficult to offer the benefits that their employees want, such as health insurance or paid overtime. In the past year, changes to federal rules have made it even harder for businesses to know what benefits they can and should provide to their employees. However, benefits don’t have to be difficult to choose and administer – and providing them rewards both employees and their employers alike. When job seekers are evaluating employment offers, they place heavy emphasis on the benefits an employer would give them. Aflac’s annual employee findings survey showed that 60% of employees would take a job with lower pay but better benefits. Companies must offer a competitive benefits package if they want to attract top talent. In this article, we offer four recommendations regarding employee benefits that will help businesses, especially small businesses, keep up with the job market and maintain employee morale. 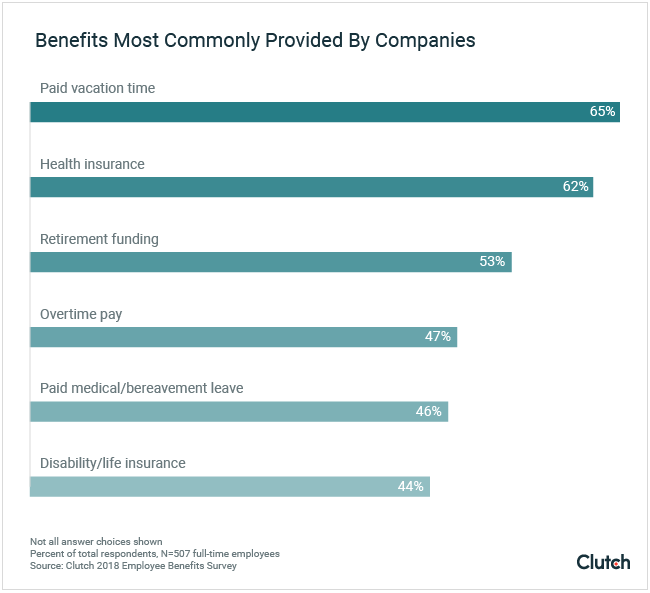 Paid vacation time (65%) and health insurance (62%) are the most commonly-offered benefits. Nearly a quarter (23%) of full-time employees do not receive any benefits from their employers. Over half (55%) of employees say that health insurance is the most important benefit in terms of their job satisfaction. Childcare benefits are rare, with only 21% of full-time workers receiving paid parental leave. Just 8% receive some kind of childcare stipend. Millennials are more likely than other generations to prioritize paid vacation and overtime, and less likely to prioritize health insurance, indicating a generational divide on how benefits are valued. 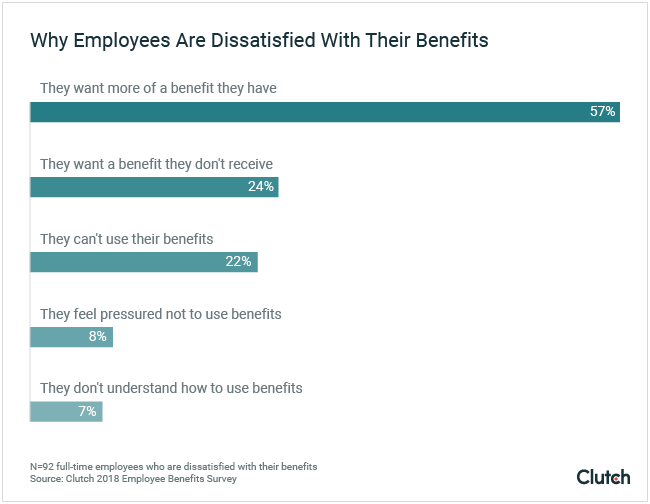 52% of employees who aren't satisfied with their benefits want more of a benefit they already have, and 14% want different benefits altogether. The term “employer-sponsored benefits” refers to non-cash compensation that companies give their employees. These benefits provide for employees’ well-being. Some benefits, such as Social Security, worker’s compensation, and health insurance for companies with fifty or more employees, are mandated by federal and state law. Most, however, are voluntary. This means that businesses choose which benefits they offer to their workers. Happier and more secure employees are more productive. According to research from the University of Warwick, happy employees perform their jobs 12% better, while stressed, dissatisfied workers perform 10% worse. Providing benefits for full-time employees shows that employers are invested in their employees’ health and their lives outside the office. For employees, benefits provide the springboard they need to do their jobs well. Companies attract the best-qualified employees when they provide access to employer-sponsored benefits. However, not all companies offer benefit packages in the first place. The most commonly-offered benefits include paid vacation time and health insurance. 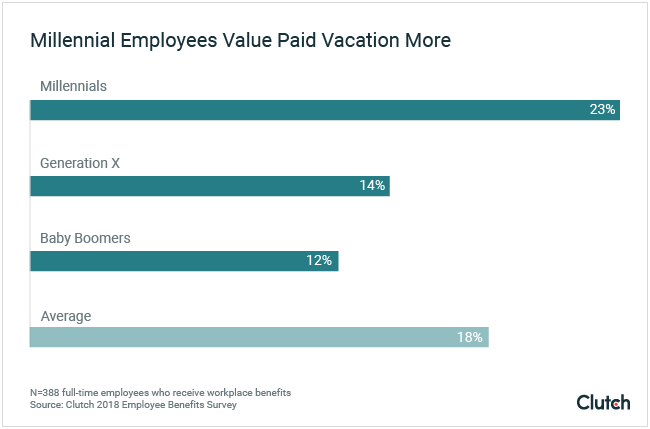 Because these benefits are so common, employees often expect and highly value paid vacation time and health insurance options when they receive an offer of full-time employment. However, nearly a quarter (23%) of full-time employees have no access to any benefits. When businesses choose not to provide employee benefits, they save money – but may lose out on top talent. Job-seekers prioritize benefits when evaluating employment opportunities. For small businesses and new entrepreneurs, offering these benefits may seem difficult. The smaller a business, the fewer benefit plans it can offer its employees. Health insurance, for example, becomes more affordable at scale. Small companies can only afford a fraction of traditional health plans because they don’t have the employee headcount of a national corporation. But that doesn’t mean small businesses have no options, said Courtney Berg, president of HR consulting firm CourtSide Consulting. Aflac provides supplemental benefits, or “extra” benefits (like dental, vision, and intensive care) that many basic health insurance policies don’t cover. Similar companies, such as Cigma, Allstate, and State Farm, provide similar policies. 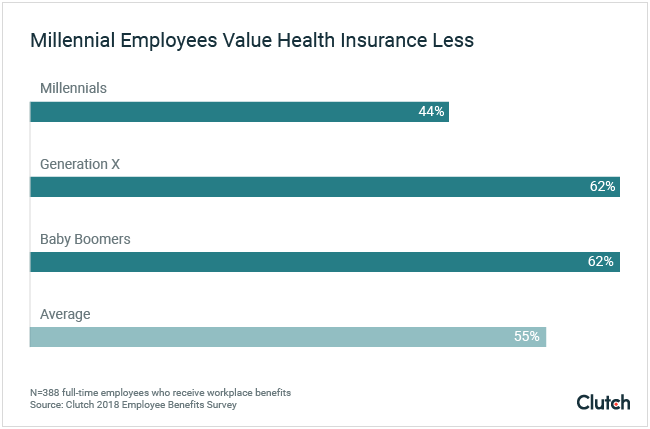 Voluntary benefits allow companies to give employees health insurance and other benefits, and those companies don’t take on great financial burden. A quality health insurance plan is key to employees’ job satisfaction. Companies in the United States with 50 or more full-time employees must provide health insurance, according to the Affordable Care Act (ACA). However, businesses with less than 50 employees are not legally required to offer insurance, which explains why 38% of full-time employees don’t have a health insurance plan through their employer. 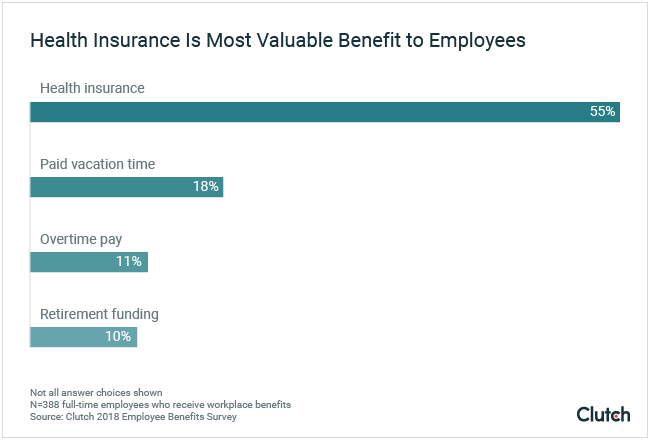 Nevertheless, over half (55%) of full-time employees say that health insurance is the most important benefit they receive. It’s not a surprise that so many employees prioritize their healthcare benefits, since an average visit to the emergency room costs over $1,200, according to research from the National Institute of Health. “Employees are concerned because both medical treatment and health insurance are so expensive,” said Chris Wolpert, managing member of Group Benefit Solutions, a group of health insurance and benefits consultants in Seattle. Companies should provide comprehensive health coverage, though, even if they’re small enough that they’re not legally required to do so. Lisa Oyler, human resources director at Access Development, a private discount network popular with employers, asserts that health coverage is a key part of the investment companies make in their employees. People are a valued asset. Offering these benefits and educating employees on how to utilize them is an investment in workers and in their long-term health. One way to offer a comprehensive health insurance plan (or several) is to partner with either an insurance broker or a professional employer organization (PEO). While offering health insurance may seem expensive and complicated, employees highly value a quality health insurance plan. Businesses should recognize that employees want various types of benefits, and their needs depend on their age, gender, and number of dependents, among other factors. The majority of workplaces do not offer paid parental leave and childcare stipends – but they should. Women in the workplace are disproportionately affected by the issue of balancing work and childcare. According to a study by Fractl, 23% of women would take day-care services into heavy consideration when choosing a job, and 24% feel the same about paid maternity leave. Only 11% of men would take day-care services into heavy consideration, though, and 14% would give paid paternity leave the same weight. “The benefits that are important to men are not always necessarily important to women, and vice versa,” said Pharris of Fairygodboss. Much of that disparity is due to the amount of time women spend caring for children and/or elderly parents. According to the Bureau of Labor, women with children under the age of six spend one hour a day providing physical care, while men spend 26 minutes doing the same. However, only 21% of full-time employees have paid parental leave, and only 8% have some form of childcare subsidies. For companies to truly invest in employees, especially female employees, they must also invest in their employees’ children. Different generations feel more strongly about certain benefits than others. Older workers are more likely to place the greatest importance on health insurance and retirement saving options. Only 44% of millennials (ages 18-34) name health insurance as the most important benefit they receive, but 62% of Generation X and baby boomers say it is most crucial.Paul Aemisegeo, founder of PayrollMart, which advises on payroll and HR solutions, says that younger members of the workforce don’t make use of employee-sponsored benefits as often as their older peers. He cites research by the Kaiser Family Foundation saying that 55% of adults 19-34 receive insurance through work, whereas 62.3% of adults 35-54 receive insurance through work. Part of this difference is because adults 26 and younger may remain on the healthcare plans of their working parents, which lowers the number of young adults who look to their workplace for health benefits. Furthermore, middle-aged workers (Generation X and Baby Boomers) have more health concerns, which make health insurance a necessity. In addition, younger workers prioritize paid vacation time and overtime. Nearly a quarter (23%) of millennials say that paid vacation time is their top priority, while 14% of Generation X and only 12% of Baby Boomers say the same. That downward trend extends to overtime pay as well. Younger workers’ higher emphasis on vacation time and lower emphasis on healthcare is likely a generational phenomenon. Most millennials would rather travel than buy a home or pay off a debt, according to research by Airbnb. In addition, a study by the Harris Group says that millennials prefer to use their money on experiences rather than things. Employers can cater to their younger workers by creating flexible vacation policies that provide a base number of paid vacation days. Positive dialogue ensures that full-time employees get the benefits they want. Nearly a third (32%) of employees say that they feel neutral about, or are not satisfied with, the benefits they receive. Of these employees, over half (52%) say it’s because they want more of a benefit they already have. When HR teams encourage clear conversations about benefits and put feedback systems in place, employees can express their concerns instead of stewing in frustration – or even quitting. In order to accommodate more employees, consider offering many types of benefits, from life insurance to disability to parental leave, that employees can choose from. A cafeteria-style benefit system allows employees pick the benefits that fit their lifestyle. “As an employer, you’re saying, ‘Maybe we’ll pay for medical, dental, and vision, but we’re also going to offer other lines of coverage. Our employees will pay for those, and we’ll payroll deduct the premiums,’” said Wolpert of Group Benefit Solutions. The upside of a cafeteria system, Wolpert added, is that it puts choice back in the hands of employees. In most cafeteria plans, employers give workers a certain number of pre-tax dollars, which workers then choose to spend on the benefits they find most useful. If an employee wants a benefit, such as a health plan, whose cost exceeds the amount they’ve been given, he simply pays a premium. Cafeteria-Style Benefits: A system in which employers give workers pre-tax dollars, which workers use to purchase the benefits they find most useful. Oyler of Access Development mentioned Teladoc, a tele-health service that provides doctors’ appointments via phone, as an example of a benefit that would work well in a cafeteria-style plan. “The Teladoc copay can be as little as $5 or $10. I used Teladoc recently and got a prescription for my cough. It took me 15 minutes, and I picked up my prescriptions on my way home,” Oyler said. Employees are embracing Teladoc because of its convenience and low cost, so employers can cater to that desire by providing Teladoc (and other similar benefits) as an option among many forms of benefits. When employers are flexible, receptive, and communicative about the workplace benefits they offer, both businesses and full-time workers profit. Even small businesses, which traditionally can’t afford many benefit options, can negotiate creative, customized plans and look into supplementary benefits such as Aflac. Ultimately, the goal of employer-sponsored benefits is to deepen the bond between an employee and their place of work. Offering benefits like health insurance may seem expensive and technical, but employees deserve to know that their workplace values them. Clutch surveyed 507 people who are employed full-time in the United States. Fifty-two percent (52%) of respondents were female, while 48% were male. Respondents were evenly split among age groups: a third (33%) of respondents were 18-34 years old, while another third (34%) were 35-54 years old, and the last third (34%) were 55 or older.